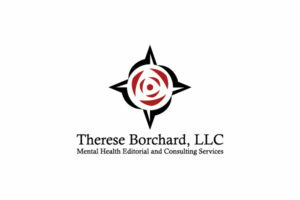 Therese is the author of “Beyond Blue: Surviving Depression & Anxiety and Making the Most of Bad Genes,” “The Pocket Therapist: An Emotional Survival Guide,” and “What Does Depressed Mean? A Guidebook for Children with a Depressed Loved One,” among other titles. She holds a Master of Arts Degree in Theological Studies from the University of Notre Dame and was awarded an Honorary Doctorate of Humanities Degree in 2011 by her alma mater, Saint Mary’s College, for her outstanding contributions to the field of mental health. She is the recipient of the 2014 Ray of Light Award by the Dave Nee Foundation, serves on the advisory board of the National Network of Depression Centers, and is a Special Advisor to the Johns Hopkins Mood Disorder Center. Therese lives with her husband, Eric, and their two children, David and Katherine. Click HERE for her personal story. Your words to Mother Teresa are priceless! Sounds like something I would say in the presence of greatness. I stumbled upon your blog last night and couldn’t stop reading. You’re a very gifted and highly entertaining writer. I found this site only because of a long research on welcoming death… I felt for almost the very 1st time someone got it… My friend is fighting cancer she wants life, I have cried because I wish I was the one that had it! I wouldn’t get treatment, I would welcome death with open arms. Hi Sheila a lot of us are living this way. Get this, I live in suicidal thoughts and then when I got cancer I had to fight to stay alive because “it’s the right thing to do”. My kids have told me so many times that they need me here. And bow that the cancer is over I’m back to feeling suicidal. It’s almost as if the cancer gave me something to focus on. I was suicidal free for a year. Isn’t it weird how the human brain works. I’m convinced that O can figure out how to best this PTSD I suffered from abuse. I turned my brain off to protect myself. Their has to be a way to turn it back on. There just has to. This depression is destroying my soul daily. Hi Sheila a lot of us are living this way. Get this, I live in suicidal thoughts and then when I got cancer I had to fight to stay alive because “it’s the right thing to do”. My kids have told me so many times that they need me here. And now that the cancer is over I’m back to feeling suicidal. It’s almost as if the cancer gave me something to focus on. I was suicidal free for a year. Isn’t it weird how the human brain works. I’m convinced that I can figure out how to beat this PTSD. I suffered from abuse. I turned my brain off to protect myself. Their has to be a way to turn it back on. There just has to. This depression is destroying my soul daily. Hi Whatnext and Sheila. I just wanted to say hello. Like you I just found this bog. Like you I have lived under this Niagra Falls of anxiety and depression for fifty years. Started when I was nine. Always fought it. But you could never tell. I thought I was just scared and if I did what I was supposed to do, the fear would go away and I would have sense of well being. I did what everyone else did, worked, looked pretty, was in the military, was a lovely bride, graduated from college blah, blah, blah but inside just dying. I remember being nineteen years old, in superb health and lying in bed for three days, crushed with depression, unable to get up except to feed my cat and cuddle her. I have tried numerous medications. Most were fair to good but I stopped completely because I felt they were like a mask and not really helping. Side effects were many. I have seen many therapists and a few psychiartrists. Some of the first words out of their mouth are “what a pretty face or but you are such a talented artist”. I want to die when I hear that. IT IS A SHELL I WALK AROUND IN. I am grateful for the many things I have in life and count my blessings but the horrible feelings swoop in from no where. I fight back with scripture and distraction and food :(. I don’t want to be this way. I know others feel different. Anyway I am rambling and should get to my points. My first point is I recently stumbled upon DRI’s (dopamine reuptake inhibitors). I never knew such a medication existed. A few years ago I was taking some pain medication (tramadol) for a condition. and as always when I take pain meds I was more chipper and happier on it. Motivated and more positive no matter what might come my way. NOT HIGH. Because I fear addiction, I never even finish my prescriptions and lay them down and try to soldier on. I had a GP I did not like but was kind of stuck with, so next time I saw him I said to him “is there any anti depressant that has the same effect as tramadol or oxycodene (not oxycotin, never took that), I feel normal and happier when I take it and it even lasts for a few days without the medication.” He responded “well you could always grind it up and snort it”. I won’t go into the reaction and words I had. You can guess. I never saw him again. It took months to try and calm down over that. After lots of research I am thinking it is a DOPAMINE problem. My symptoms fit perfectly. Medications exist that address this. I am new at this and have not even found a doctor that would address this but I wanted to give both of you some hope and let you know in your darkest time someone is close by that CARES and understands. I’m not sure what she said to Mother Theresa but MT was actually cruel and insufferable. The Catholic Church reports her as a saint but there are stories from children that she saw them as lrss than, inhuman and treated them poorly when the cameras were off. That she was often heard speaking of poor people as if they were cattle instead of people. That being said I stumbled on an article of Therese’s about sneezing. Weird analogy but I live in suicidal depression due to an abusive husband so I get it. Therese – I don’t think you mentioned either of those two tidbits at book club!! Wow! So glad I found you via Twitter. You’re an inspiration. I’ll be following your blog. I ran onto one of your articles about the effects of chlorine, candida, etc etc… and, I wanted to suggest to you that if you have any stomach problems, try CULEN; It’s an herb and you can drink it as tea. I learnt about it in one of my hiking trips along the Peruvian Andes. Believe me, it works like a miracle and you will never again need to take Pepto Bismol, Magnesium milk, antiacids, yogurts or especial agents to improve your stomach flora. I admire you greatly for what you do, your faith and your courage. I have a favorite sister, her husband killed himself 4 years ago due to bi-polar. It talks about bipolar. Please watch. Please know that you are in my prayer. Thank you, Therese! You are doing important work. Tonight, I found your article, “5 Things to Do When You Feel Insecure” and it was very helpful (far more so than the “10 Things” article I found by a Ph.D. in Psychology Today). After reading that article, I saw your book and blog. I bought your book and joined your online community. Thanks for being a lamp unto my feet. Did anyone hear the talk show on a main broadcast station from Phillidelphia, where they were talking about Depression, alternative trials and testing that is taking place NOW at PENN STATE University. They actually said on the show that 50% of those with depression do not respond to these highly toxic medications. If anyone can shed some light on this for me it would be so greatly appreciated. Well guess what? My name is Theresa too! (smile) I’ve suffered and still are suffering from depression/anxiety my whole life actually. I stumbled across this blog and thought “this was meant to be” I plan on ordering several of your books to take on vacation with me to read. Thank You!!!!!!!!!!! Thank you for your book, Beyond Blue. It made me laugh, but so many comments and descriptions rang true for me. I especially related to the fact that you spend most of your energy every single day maintaining your mental health. It just never occurred to me that there may be many people like me doing that! Depression and anxiety are inexplicable to those who don’t struggle with them day to day. I put myself down a lot for not being super woman, but I would rather be even keel than go back to the abyss. I’m also guilt ridden and a highly sensitive person (how those chapters made me laugh aloud! ); I am eager to read some of your recommended books. Again, what made me think I was the only one with freakishly low tolerance for commotion and the often unfortunate tendency to absorb the emotions of everyone around me? I could go on and on. Sorry! Thanks again for baring your soul, for reaching out and connecting. Let me leave you with a story from the other night: my cat brought a baby field mouse up from the basement. The poor thing was gasping for breath. I gingerly picked it up with a papertowel and took it outside. I then proceeded to “sit” with it for 30 minutes so that it wouldn’t die alone! And I still feel guilty for what my cat did and for that little mouse that never got to live a full life. I remind myself every time, that God cares for every creature and thank him for this. Ai caramba! Therese, Both of your books have helped me so much. I appreciate your taking the time over a year ago to respond to me personally when I was in a severe depression. Thanks to a new psychiatrist and my psychologist, I feel better. I am still struggling with perfectionism and symmetry in OCD, but am getting better at recognizing and accepting life the way it is. Everything does not have to be perfect and/or symmetrical. I wish you the very best. You have helped so many of us. Natasha, I found out about Therese from a coworker just last week and decided to check her out today. I have suffered from anxiety and depression my entire life. I have been medicated for about 13 years but struggle daily. I too am guilt ridden and a highly sensitive person and when I read your post I could so relate. I have a hard time finding people who understand me and what I am going through. It is such a blessing to read posts like yours and know that I am not alone. Thank you. I am now re-reading your book! Wow. What a load off. I am contemplating hospitalization. I don’t want to die. I just cry all the time and don’t know what caused this? I think my loved ones just want me to go away……. life is a gift of God. God loves you. take care ! You are a success. I think you are having a major bout of depression . I went through that in my early 20’s. I cried and just did not know what was wrong with me. I felt so horrible and my mom just did not know what to do. I went and saw a psychiatrist and I was scared and embarrassed. (this was in the early 80’s) She put me on an antidepressant and a mild nerve med and I never knew how helpful medication for depression really was. Please go see your physician, a family doctor to start with. They can evaluate you and see if your depression is bad enough to warrant hospitalization. There are also crisis help lines you can call. Do it now honey. you don’t have to live in darkness like that. Or if you feel like you can’t hold on anymore go to the nearest emergency room. Your loved ones simply do not understand what you are going through and this is very normal. It doesn’t mean they do not love you, they are scared. Just off Effexor 150 mg since early April. Tapered off as per my Dr’s instruction. Decided not to be on this drug, and go for walks and enjoy nature. Have been on Paxil 20-40 mg off and on the last 20 years and felt that a new drug in my system might be the answer to feeling less depressed/anxious. Ha, no wonder drug there. Did the best on Paxil. Still feeling the post after effects of Effexor. I am more irritable, impatient, and crying every day the last week. Going through empty nest syndrome, sort of with my only son. It was only he and I against the world, or so it seemed, as a single parent. He’s 23 now and I feel like “what now”. What do I do with myself now at 63. Had him at 40! I think we overly sensitive, compassionate people are more prone to absorbing sadness in life, unfairness in some outcomes, such as a cancer at the onset of retirement, or a tragedy of some sort. Vielen Dank, für dieses tolle Buch! This post is so poignant. I am not married but my Mom is my best friend and she worries about me and it’s really hard for me to balance that space as you said between being honest or becoming strangers. That goes for anxiety and an autoimmune condition that I battle. Sometimes I’ll say I’m fine or I slept well when she asks but she always knows and she claims she wants to know the truth so I give it to her but only on my worst days to I really and truly give her lots of details about my struggles. Bless your heart. I’m so sorry you’re having such a bad time. I pray that if and when I get married that I will have a husband like your husband who is steadfast, loyal and true. This is a really interesting post and I respect you so much. I am glad you are sharing more about your struggles and what you are doing to try to get well. I agree with you that there just has to be mixing of the two types of medicine. I spend a lot of time working on keeping myself … how shall I put this…. in a functional place? I guess that’s the best way I can describe it. I mean these last 3 months have been so bad with a painful and exhausting autoimmune condition and I’m finally (through therapy) learning to “give myself a break” and not be so mad at myself or blame myself for causing my health problems which creates more problems. And I’m learning to be okay with the fact that I don’t have the stamina I usually do. SIgh. I’m sure you know how it is. You are so right that I need to learn to dance in the rain and not have this out of reach goal for myself of getting rid of all the pain and bad stuff. The goal is to live as I am and feel more content and less frustrated. Thank you so so so much for this post! You say so beautifully what my therapist has been trying to tell me but it just didn’t really sink in until I read your post. I read this post a few weeks ago and found it really interesting and I want to read her book. My father is from India and he has mental illness though he’d never admit it, let alone seek treatment. I think for him, it really is a cultural stigma. I recently began reading your posts on everydayhealth.com. I have Hashimoto’s Thyroiditis, Raynaud’s, and a few other flurries of biological self-attack, plus anxiety swings. I just wanted to say THANK YOU for your candor. Your blogs are very illuminating to me, comforting and informative. I appreciate your approach and your honesty about these things many of us struggle so fiercely with. Thank you so much, Heather. I so appreciate that. I have just finished reading “Beyond Blue…” the book. Thank you for writing it. My son suffered from depression and alcoholism and he took his own life two years ago on July 10th. I have struggled to understand why and your book has given me insight into his pain and suffering. His depression was untreated because that was his choice. I think because he was scared of the demons, of medications, the shame and a myriad of other reasons. He had a previous attempt and was hospitalized across the country from me. Because of HIPPA regulations I was unable to talk with anyone about it. I tried to emphasize with the hospital the seriousness of his mental state. He apparently agreed to hospitalization of “treatment” of what I don’t know. There was no bed available in the hospital where he was, so he was given his papers and told to go the hospital across town. He walked out the door and left. He eventually came to my home and I tried my hardest to get him help, but, with his resistance and no job or insurance I could not. He hung himself in my bathroom when I was away visiting his brother. This story is no different from so many others. As a society we must do better for those who suffer a mental illness. Your efforts, insights and work are appreciated. Again, thank you. Thank you, Therese. I have found a wonderful Suicide Survivors Support Group in Rapid City and attend regularly. Out of that group there are several of us who have become good friends. All of us lost our sons and depression and alcoholism were involved. It is important to me to read and understand the pain our loved ones were living. I was fortunate in that my pastor is a loving priest and our Deacon is a close friend of over 45 years. I have and had a great deal of support at the time of Jimmy’s death. I only hope to pass it on. There is hope and healing for those of us left grieving. 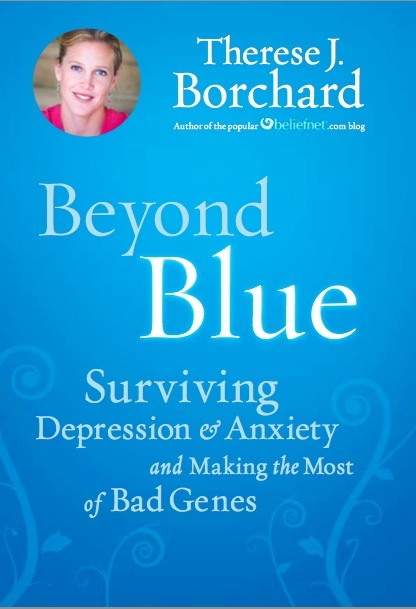 Thank you for writing your book, Beyond Blue, I read it all in one sitting today and it gave me a lot of hope when I couldn’t get out of bed today. I am in love with this blog site, thank you so much. I’ve been suicidally depressed for about two years now, and everyone says it will get better, but as the days go on, my confidence and hope crumbles just a little bit more. I hate myself so much for my disease that I’ve convinced myself that taking my own life might relieve others of my burden, and so making it to midnight without acting on my urges is the best I can do most days. I don’t have a family, I’m young, and could potentially have a bright future if not for this disease. I feel like a freak, watching other young women my age go about their business, function in the world, and achieve things, when my biggest achievement each day is getting out of bed (which only happens some days). Please keep writing, and I’ll keep reading. Would also appreciate any feedback or support. My name’s Ashlyn, and I’m 16. My freshman year of high school (I am currently a junior) led me to believe that I was a bad seed. If there was a choice of a good and bad road to turn down, I always seemed to pick the bad one. I hurt nearly everyone important to me, and I don’t even know if I cared. Last December, though, something hit me and I went through this ordeal that I, and everyone else in my life, likes to call ‘The Big Turn Around’. I picked myself up off of that battle ground, and crawled my way to safety. Then began the building up of what I had once ruined, which was beyond difficult. I did it though. I reshaped myself into the person I always wanted to be. Although in May, I discovered, after a mishap at school, which led me to a cardiologist, which, in tern, led me to a answer: I have severe anxiety. 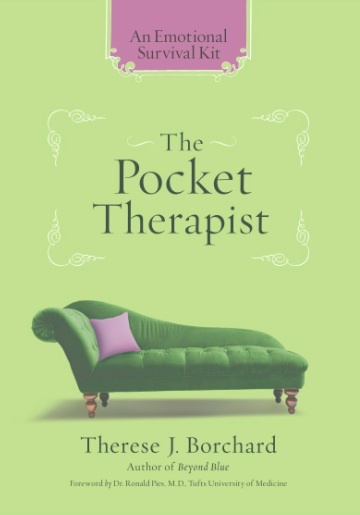 3 weeks later, I picked your book (The Pocket Therapist) off of a book shelf in the condo I was staying in. I thought, laughing at the idea of it, “this should be a riot!” Then, once I started the first page, I knew that it was something more than just a self-help book. I got up every morning for a week and read your book in a chair in the sun by the pool during my quiet time. And I finished it. Yet even now, every morning, during my quiet time, I open the book to a random spot, and start my day out with one of your tips. Some days are good, some days are bad, as all are, but receiving some of your wisdom is like having stepping stones to and from through a river of hot coals, a big help. Your book has pushed me to dig deeper within myself so I can attempt to figure out who I am and what I’m doing here. I just wanted to thank you for putting your words, your thoughts, hell, basically your diary out there for others to do what they please with it, because it’s helped me indefinitely. You should be very proud of what you’ve done and what you’re doing in your life. You’ve worked so hard, and though sometimes you take a wrong turn (as we all do), you seem to have a good understanding of what the good road looks like. Thank you again. You’re a godsend. Thank you so much, Ashlyn! I so appreciate that! I just wondered if you had used any of Michael Yapko’s resources. Hypnosis may help you in your struggle with depression. My heart goes out to you. Blessings…. Therese, you are my new favorite writer, and all thanks to a Psychology Today article who quoted your “What I wish people would know about depression.” My question is this, I have been wanting to become a blogger and write on such topics as depression and spirituality and psychology subjects that I have been involved with for a long time. But then I find blogs such as yours, and I wonder if I really have what it takes to be a writer. How did you get started? Does one have to be fully recovered in order to advise people about mental health? I’ve always wanted to be a writer and have kept journals since I was 15…but…I just don’t know. I’m also quite concerned about anonymity, as I’m afraid that revealing things about myself might affect my chances for employment. Any advice you can offer would be greatly appreciated. i guess i’m a moron…but…comment@thereseborchand.com immediately bounces back to me. Therese… I am in awe of you. So glad I found your article on Robin Williams and your group Beyond Blue. Cardiomyopathy is a chronic illness that affects the heart f(in more ways than one) and can be inherited or acquired from a virus, so both old and young people can be diagnosed with a heart that is not working efficiently and of course this is very frightening. It would be easy to let negative thoughts take you down that spiral into depression and many folks with this disease struggle with that. I had to give up the job that I loved and my passion for contemporary dance and exercise (former teacher) and knew that if I did not remain positive i would end up talking to the walls, in those early lonely days of diagnosis when i found myself at home alone, missing my work, my colleagues and my interests. I took up writing (had dabbled in it a little before as a teacher of dance and drama ) I also replaced my vigorous exercise regime ( doctor’s orders) with tai chi and mindfulness and currently work as a volunteer with a local mindfulness project. All of these have been great therapy for me and my heart function has improved and generally I remain very optimistic. I have self published 6 poetry books one of which coincidentally is called ‘Out of the Blue’ and I wrote it especially for the cardiomyopathy association to raise money for them as they rely on charitable donations.I give talks about all of this and have raised over £6000 for heart charities from the sale of my little books and poetry book marks, including my local hospital who looked after me so well. My illness has opened new doors for me and although I cannot do what I did before and need days of rest I focus on what I can now do, not what I can’t. It is also some comfort to know that my writing helps others as I am sure yours does too. Here is one of my latest poems that went viral globally when I posted it for one of the cardiomyopathy members, after thy expressed their concerns about people, especially those closest to us, not understanding an invisible illness….. I thought you and others might appreciate it…..
All I ask is that you gently hold my hand. Hi Suzanne, really, really loved your poem. It spoke eloquently to me. My ailments are somewhat different from yours, but I have the same symptoms…..having an invisible illness & hitting a brick wall. Just hold my hand. No! I typed a long comment and did not push send any way you might have gotten it any way….feeling hope full. Hi, I have been treated for depression and anxiety attacks since I was 28 years old and I am now 59. Right now I take Lexapro but some days which can turn into weeks I still get depressed and negative thoughts that won’t go away etc. My father had depression so bad that only ECT worked for him at times when the meds didn’t. he suffered so much and I have inherited it . I am very afraid of becoming like my father as I get older as they say depression gets worse as you get older I ordered the omegabrite fish oil that you talked about and the probiotic and I plan to order your books too. I wanted to help my father and his brothers who also inherited depression from my grandfather who also had it but my dad had it the worst.I also want to help those who are so misunderstood because of this illness. I admire your work so much but most of all your heart for reaching out to us. Am feeling overwhelmed by your achievements, Therese. Kudos to you. It is great to be able to help other people. Hope your outreach uplifts you every day. Dear Therese, I have written to you before and love your blog. But today is an especially horrible day and I really don’t know if I can make it. I have been in bed for days, no shower (TMI), putting off any doctor or any other appointments I had for months now – and just now had a huge blow-up with my husband. I know you can’t do anything except tell me to go to the Emergency Room, probably, or something of that nature, but I feel very – I can’t even think of the word. I am already on several medications through my doctor/psychiatrist and have also been seeing a therapist. Obviously, these don’t seem to be working. I am a spiritual person, and have tried praying, etc., but am so agitated I can’t concentrate. I live in fear that I will be put in to some “place” to get better and even though I majored in psychology in college, this still feels like a great stigma to me. I have been tamping down my feelings for months (family issues, but more to do with my husband). You may suggest marital counseling, but I don’t believe he would go. He thinks it is all my problem. I know I do have problems, but I truly do not think it is all my fault. I am sorry this was so long, but I am truly at the end of my rope. I have thought of “ending it”, but don’t feel it is right spiritually, and, it sounds mercenary, but I would want my daughter to get any of my financial assets, tiny as they are. Thank you for the lifeline. It’s just that when I feel this bad for so long, I’m unable to even get out of bed, as I said, much less try to do the good things you do suggest for this trouble. Thank you for just listening. If you have any “words of wisdom” I would be grateful, but I know you are extremely busy, so I do understand if you are not able to answer me. Dearest Therese, I can’t believe you answered so quickly. Thank you so much. That in itself stirred something good and positive in me. ( I had gone straight back to bed with the pillow over my head after taking some medication and slept a little and just checked my email when I got up and couldn’t believe yours was there.) I will try to follow your suggestions. Really I will. You are one of my “inspirations” that I look up to, like – oh, Deepak Chopra for one current example- Jesus, Gandhi, and Buddha for past ones. I do know I am not the only one feeling this way, and then I end up chastising myself and feeling worse. Yes, I will keep checking Project Beyond Blue and the Group, too, as you said – when I am not in bed – augh. Thank you for saying the horrible part will pass. You, who have been so through so much……it is a help…..even though I feel bad right now. Bless you, Therese, for keeping me in your prayers. It means so much to me. I will probably wake up tomorrow and cringe at what I wrote for all the world (here) to see. It is embarrassing to me. I wasn’t sure if it would post here as well, or just be an email to you. That is another thing, I think, after looking at the book, “The Highly Sensitive Person” that I am one in spades. I will try to get over that, but I know it will bother me. “We humans have a second brain. Come to think of it, men have three.” Your quote in Digestive Health. Why are you insulting men? Please apologize. Hi Gary , This is not a good idea to force some for apologize that also whose knowledge bringing so much relief to many people. I just found your site just felt I needed to vent. Ive tried 11 or 12 different meds to no avail, see a therapist twice a week, joined a support group and have a pretty descent sized support system of people that want me to beat this severe depression I struggle with. But every morning I wake up to basically mental torture. I pray to God as hard as I can begging and pleading for him to help me and I question if he even hears me. Im mentally and spiritually worn out. I feel like giving up to end the pain because I feel my life is passing me by as I deal with this and I cant resemble the person I use to be. I hate myself for having this condition, for feeling useless as I cant joke with my friends like I use to and they have to deal with what I struggle with. I don’t see an end to this. Im scared to fall asleep because I know when I wake up the pain will be there. I hate my life and wish I can end it, I hate that I have not been able to live up to the potential it could’ve had and I hate myself more for that. At times Ive come close to just giving up, putting a knife to my wrist to see if I could just do it. I honestly don’t know for how long I can keep going like this. I turn to my friends for help when its bad but I feel guilt for that, for burdening them with my problem. Im scared one day the pain will be too much and I wont be able to stop myself from doing something I shouldn’t. Dear Danny – I read what you wrote with tears streaming down my cheeks. I have no advice except to seek out a good therapist and psychiatrist. I am also suffering and when Therese writes about her own struggles, I realize she could be me. I suffer with getting out of bed, getting dressed, have already quit work, every little thing gets on my nerves, and even a small problem paying a bill on the phone can reduce me to tears. I went to finally see a psychiatrist last week. She said the medication I was on for 8 years was like drinking water. I am only on day 5 of Zoloft. It is difficult to wean off of one and get the other in my bloodstream and brain. Nausea and crying jags are a daily occurrence, complicated by irritability. Everyone has told me keep pounding through….Zoloft has been the best thing ever. Long long story for me….been suffering for years and yes suicide has breezed in and out of my mind. But couldn’t do that to my mom. I hate waking up most mornings. I understand. I wish you better days ahead. I understand. I truly understand. This is Amit Kumar and I am from India. I am engineer by profession. I am also having very difficult time with blues since years. I found your blog yesterday and found it interesting. Some of the alternative supplements which you have mentioned I am not sure whether it is available in India. I one more thing l like to share which has helped me lot to fight with blue is Sudarshan Kriya from Art of Living. Thanks for giving hope to many people across globe. Thanks!!! Thank you, Amit. Great addition! I wish you much peace. My wife and I just had a cute baby girl. It has been 7 months, and my wife left me abruptly and wants a divorce. I read up on bipolar depression, and was wondering how I might be able to talk to her and get her to come home with our two kids, so I can get her some psychological help? I love her tremendously and if it is a mental illness, it is not her fault or mine for not understanding each other. Any advice to help my little family and my sweet marriage. i am suffering from depression .i am feeling helpless.everyday i wake up i hope all will be fine but at last i am wrong.i want your help. Thank you , Therese for all your blogs! I have been reading them and I love it. You’re fantastic ? I just started writing for PsychCentral.com last month. I loved your blog post on Mother Theresa. Thank you for sharing your life. I too have bipolar illness. I first blogged about it for empowher.com in 2009. Glad to be back to the subject at PsychCentral.com. Hope I can shine a bit of light on it. I had heard your story at a out patent treatment, that I am going through right know. As I heard your story I seen a image of myself, and what I am going through even today. I am happy that are people are out there that suffer from the same issues that I have, and I am able to reach out to others when I need help. Thank you very much for what you, and for becoming a big help in my life, and the lives of others around me. I am an Extended Project Qualification student from Newcastle-under-Lyme School and I’m currently researching the awareness levels of food alternatives to anti-depressants. It is a topic that really interests and intrigues me. I understand that you are very experienced in the world of nutrition and holistic health and I have read some of your articles which talk about ways to combat depression naturally. I found it quite fascinating. Therefore I have decided to contact you to ask you for your personal opinion on the general awareness levels of the food alternatives to anti-depressants in the UK. I’d also like to ask for your permission to quote sections of your response in the final written project and also in the presentation that I will be delivering to teachers and friends from my School. I would be extremely grateful if you were to reply (even just briefly) to this comment. I left the following comments on PsychCentral this afternoon in response to your article, “Is Depression Always a Disease?” I am not sure why my comments were not posted. Were they deemed inappropriate or not politically correct or did someone who monitors your blog (either you or someone else not agree with what I had to say? I’d appreciate a response from either you, John Grohol or a representative at PsychCentral regarding your censorship policy. I stand in my truth based upon my own life experience with depression. I think it is only honorable to consider my perspective and act respectfully even if you are not in full agreement with my views. Thank you for your consideration. Humans are not ‘diseased’, ‘disordered’, or ‘mentally ill’. Humans are human. Human beings experience pain and suffering as part of the human condition. As soon as we start recognizing the effects of childhood trauma and failed attachments as the source of much pain and suffering in this world, the better. I applaud you Therese for your curiosity and honesty about the possible source of your own suffering. My own story: I was chronically depressed for three decades. Sometimes the depression was so bad, I’d lay in bed for months. I also went to some very dark places. In my thirties, I was told my doctor that I needed psychiatric medication because my depression was genetic. It wasn’t true. I was later told I was bipolar. This also was not true. The source of my depression as well as anxiety was childhood trauma that I chose to put away. To make a long story short: I got into trauma therapy. I processed the pain. Today I am no longer depressed. I no longer need to take psychiatric medications. I believe that psychiatrists and doctors need to begin to act more ethical, honestly and with a greater degree of integrity. For a trauma survivor, like myself, being lied to felt like another betrayal, not unlike the betrayal I experienced in childhood. Many people identify with the ‘stop mental illness’ stigma movement (especially on Twitter) because I think it gives them a sense of validation and identity. But ‘mental illness’ or a disorder such as ‘bipolar’ is not an identity. Although Big Pharma and those promoting psychiatric medications might have you believe it is your identity. Your identity develops as you learn to tolerate the full range of the human experience. Your identity grows and shifts when you no longer need to put a lid on your feelings. These feelings are often unconscious and buried. CBT does not help because it does not facilitate access to the uncomfortable feelings and content that a traumatized child often has to put away to survive. This is not easy work. And yet, I believe, in order to fully integrate, in order to live an authentic existence requires that we learn to be honest with ourselves, our limitations and learn presence through meditation, yoga, being with nature and other daily practices. Regarding EFT: I understand that many people like EFT. They see benefit from doing this technique, however,it does not take the place of trauma work. It’s a technique among many that an individual may choose to promote healing and integration. Most people need to use a variety of things to get the best results. There’s also biofeedback, EMDR, somatic work. Treatment modality often depends on the nature of the childhood trauma and abuse. I’ve worked in a peer support capacity with trauma survivors. While I think it’s important to empower ourselves to become our own healers and to seek out what methods work best for our own healing, this does not take the place of trauma therapy work! There are lots of life coaches out there as well as charlatans eager to take money from the vulnerable. Please consider working with a professional, licensed trauma therapist if you think you have unresolved trauma issues. Hi! i went to my local barnes and noble to try and pick up your book, and they didnt have it. 🙁 I thought i’d look on your site to see if there was a e-book edition and happen to see that you were in my same town! i can try and order it on amazon but do you know where their might be a copy for sale in Annapolis? I have never connected with anyone on this subject like you. I would like to know how you would like for people who serve others by sharing their experiences and learned coping skills, like. I am concerned about infringing on your copy rights. Could you give me a guideline on how to share your information without doing this. Basically, I am interested in sharing some articles in group settings. And do some one on one affiliate marketing by leading people to your sites. The books I can Buy.The thoughts I can teach. Just need to know how. a small discussion group, attempting to bring back friendships which i’lost over time and going on museum shows and looking at art and photo shows,etc. with my older brother which leads to discussions both present and future,not the past. the skills which people have for relaxing with others,listening and envying their lives a bit told me that I never 1)was allowed to handle situations and converse with others. These simple activities come slowly but i have hope esperanza. HE IS ONLY IN HIS EARLY FORTIES! I spent all day today learning more about you and the inspiring work that you do. I don’t think words can express my gratitude for your work and for coming across your blog. After losing a friend to depression I made it my mission to do something about mental health. I built an anonymous app that connects you to similar thoughts, as you express yourself. Letting you know you are not alone. I would be humble for the opportunity of connecting with you further and getting your thoughts and advice on our movement. Hello! My name is Lauren Sayers, and I am a volunteer board member at the Anxiety Resource Center, a small non-profit located in the heart of Grand Rapids, Michigan. I recently came across your article 5 Ways to Manage Autumn Anxiety while researching mental health and anxiety related topics for the ARC. I found your article informative and relatable and know it would greatly benefit our audience. Briefly, as a non-profit, we exist to provide both a physical place, as well as a web-presence reaching out to those struggling with anxiety disorders and to help reduce the stigma associated with these illnesses. At our Center, we offer a variety of free resources and services including a lending library, support groups, social outings, and professional presentations. Thank you, Therese, for considering this request and for adding light to the many lives struggling in darkness. I look forward to hearing back from you. This note references your article “How Does Your Depression Affect Your Child?”(Feb.24,2016). I am 71 1/2 , a RN, and have 4 grown children – 47, 47, 47 and 34. For 6 weeks every year my son and surprise twin daughters are the same age! My daughter L. is 34, is an OB/GYN about 50 miles from where I live. For the last 25+ years I’ve been treated for depression by many assorted inadequate psychiatrists and therapists with 25 or more meds which never helped. I have been off all psych meds since Spring, 2016 and feel better physically and sort of mentally than I have in years. Right now, and I may be mincing words, but I’m not depressed, just completely brokenhearted. I’ve been divorced 11 years from an MD who has covert, malignant,and vindictive narcissistic, sociopathic, schizoid, sexually addicted and sexually abusive personality disorders – of course, never formally diagnosed or treated. I now believe that the first shrink I ever saw in 1990 was correct and that my basic problems are Adult Children of Alcoholics and Dysfunctional Families based and unresolved grief over so many childhood losses and even more losses in my last 26 year marriage, and NOT depression. And now some PTSD after all the things and the gaslighting he did to me. My youngest daughter was conceived after a tubal reconstruction and a miscarriage and is a most remarkable person whom I would have loved and enjoyed had she been dumb as dirt and not beautiful and good and brilliant. I believe I was a wonderful mother to all my children – intentionally because I knew what a crazy, violent family and childhood I had and resolved always to let my children know how loved they were and how much they mattered and to help them get where they wanted to be in their lives -, and I was a wonderful wife. 13 years into our marriage he announced that he had been having a 3-year affair with his nurse. I turned to him and said “You would never do that!” And he said, but I have. 5 months later, playing me, loving me, but still messing with the nurse, he told me he was leaving me and taking our daughter with him, and I made a suicide attempt b/c in the small Alabama town where we lived I thought I would lose the love of my life whom I was sure God had brought to me and lose my daughter and not be able to prevent it. After a couple of months we reconciled and really, I thought, had another good 10 years of marriage and family. All that time he was having big and little affairs that I really did not know about. The wheels started to come off in 2003, and in January, 2004 I had a complete dissociative break, unaware and totally unplanned, shooting a hole in my kitchen floor with his snake pistol, and waking up from the noise of the gunshot. My daughters hospitalized me, not my spouse who abandoned me and served me with divorce papers in the hospital. I did everything all these different doctors told me to, was devastated by losing my husband, and L., in college and medical school, distanced herself a bit from the always healthy close relationship we had enjoyed, but we still saw each other fairly regularly. I was involved with her moving off and on, visited and lunched and dinnered, took part in her activities and planning her wedding and enjoying and staying with her new baby, helped with new houses, etc. But suddenly 31 months ago she wrote me and said she couldn’t be a wife, mother, homemaker and doctor and maintain a relationship with me. That she loved me and was seeing someone and taking some meds and that my depression had bothered her and she told me to quit reading between the lines and she didn’t plan on this being forever. She’s even blocked me from Facebook, and all her emails now go to her husband. I’m so embarrassed and ashamed. I’ve tried to observe her boundaries, but occasionally have written letters accepting blame for everything I can think of and sent gifts for her baby’s birthday and Christmas and recently just a grandmother gift. Recently I accidentally found out that she is pregnant again using IVF. And her husband wrote me and said not to write or send any more gifts. I’ve already needlepointed Christmas ornaments for her daughter and new grandbaby – that’s what I always do – Christmas ornaments of some kind – for my 12 grandchildren at Christmas – , and I’m going to send them after Thanksgiving, even if they send them back. She and I are both missing out on so much. I am devastated. I have recently developed Type2 Diabetes and high BP, am older b/c I had her at 37, but am basically in pretty good health, but am so afraid I’m going to die and never see her again She has become aligned with her father, much closer than growing up, monster that he turned out to be -narcissism personified. I found out so much AFTER we divorced, even that he’d molested a teen-age girl spending the night in our house with an older daughter.I’m a trauma and ICU and ER nurse and a good person and would never have tolerated that had I known about it. We hardly ever argued, and never in front of L., but I’m sure there were atmospheric changes in our household, but I tried to make life good for all of us. I am overwhelmed at this loss because we really were close in such good, healthy ways. A committed Christian, I’m having trouble trusting God – like I always have had trouble, thinking that God would come through for everybody else, but not for me in this life where I could enjoy it. I can’t even be grateful for the ultimate gift of heaven. I saved your article, as so many things you’ve written have spoken to me, because of my dilemma. I’ve been through so much, but I am such a good, nice person and have tried so hard all my life to make a difference for my husbands and children and for others. I’m not sleeping, waking up crying, isolated, so lonely, reading books and listening to CD books constantly,going to Body Pump, and church small groups and Bible studies, gave up watching Property Brothers and Fixer Upper because it’s so painful to watch all the happy families.I think I’m writing to ask if you think there’s any hope that she’ll come back to me. I feel so responsible because of the depression that really WASN’T and the help I didn’t get. That first shrink explained the ACOA stuff to my husband, and he was angry and felt blamed, which he wasn’t. So that Dx went nowhere. Off and on I’m a little bit angry. Thanks for all the good things you accomplish with your writing. I admire you and your family. I’ve been following your blog for quite some time now, and I would really like to contribute if possible. I’m reaching out to see if you’d be interested in featuring a guest post from FindaTopDoc.com. 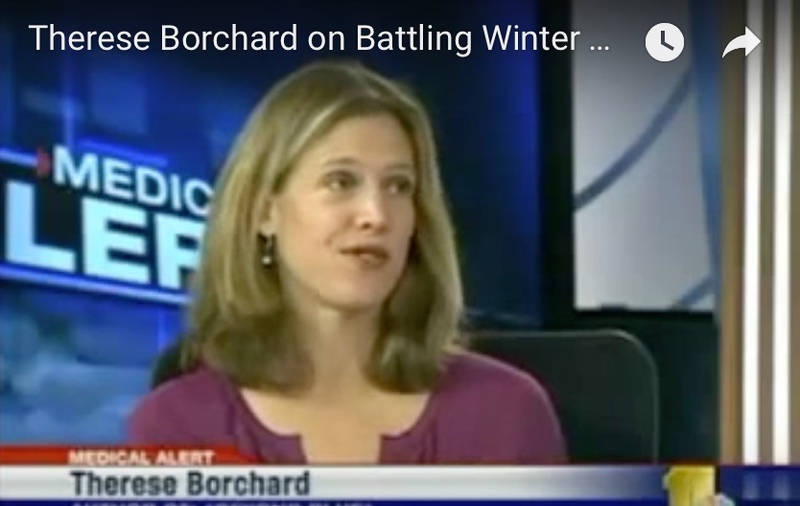 We also have a blog on our site at [thereseborchard.com], where we share resources and tips. 5. Is there a treatment available for depression? My name is Megan Thompson and I am currently in my final year at University. I am conducting research into the correlation of mental health and wellbeing with fitness and physical activity for my dissertation topic. I was wondering if you would be able to help me out by answering a few questions for me relating to this. If you are able to help I will send the questions over via email for you to answer at your convenience. I’ve helped countless clients deal with depression, mental illness, and their overall wellbeing. How can I help you? Very genuine and caring blog. I help many clients deal with depression. 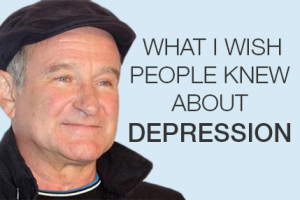 I’ve accumulated a lot of knowledge and understanding of depression. I would like to contribute to your next articles so you can reach an even bigger audience. I will also advertise and promote you on all of my social media. Therese, I found your website about three months ago. After reading a few posts I purchased Beyond Blue. Compared to many people, my depression and anxiety isn’t bad – I’d call it moderate. The struggles of many break my heart. I dealt with depression and anxiety on my own, but when I began to get thoughts like “it would be just fine if I were dead” I knew I needed help. My depression and anxiety was made worse by the Shingles which I experienced two years ago – I still suffer from postherpetic neuralgia. I also struggle with tinnitus that can be quite loud. Beyond Blue is a major blessing for me!!! You give me hope, a plan of action, put things into perspective while even making me laugh which is especially needed at times. And, I didn’t think I’d find someone to help me whose faith in God is an important source of strength with this struggle. God bless you, Therese, and thank you very, very much!!! I work with a company called FindaTopDoc, an online doctor listing and Medical Information in the USA. Tried to find an email address for you, instead will mention it here. In the sidebar of this site, you have a textwidget that is “About” you with your profile pic, etc. The URL for Project Hope is incorrect. Ironically it took me to a “No such server” sort of page, leaving me ProjectHope-less. As background, I am working with an eco-luxe skin care and beauty brand, Kari Gran, that recently launched a bold campaign titled “Wear Yourself In.” It serves as a counterpoint to the ridiculous notion women need to be “fixed up” to look their beautiful best, and instead encourages the over 40 crowd to reflect on and respect the life they’ve lived, the wisdom they’ve gained, and the skin that’s weathered it all. In short, we want every woman to be her own cozy, comfortable, well-loved favorite pair of jeans. We created a site that hosts campaign collateral, essays written by our partners, and other content that aligns well with our campaign – it can be found here: wearyourselfin.com. We would be honored if you would grant us permission to share your piece on our site as it fits so well with the storytelling we are doing within the campaign. You would of course be given full credit and we would link directly to your article within the post, too. I’m happy to provide additional details on the campaign, if you’re interested, and I look forward to hearing from you! Thank you for the article on depression/obsession. Mine came simultaneously. An incident I thought long repressed and severe depression. I thought for a time I was nuttier than I thought. We are excited to be embarking on yet another amazing online event on behalf of LiveFitNow.tv: “Healthy Never Tasted Better” – 30 Days & 30 Ways To Eat Fit! I am honored to invite you to become part of our presenting experts’ panel. You will be joining over 25 other leaders in wellness and nutrition who will be sharing their cutting edge advice on fit living through fit eating. *** This is an online event. You will be interviewed over skype. All expert interviews will be pre-recorded videos, about 20-40 min long. Summit start date will be May 3rd. The Healthy Never Tasted Better Summit’s mission is to show people how easy and fun it is to commit to healthy delicious meals which is the cornerstone for living fit. Is healthy living aligned with your message? Our Host, Jill Smart, is an inspirational health leader. After being housebound for two years due to a severe knee injury and multiple surgeries, she transformed her life with whole food nutrition, juicing, fitness and mindset. This resulted in her complete recovery and an 80 pound weight loss in less than one year. 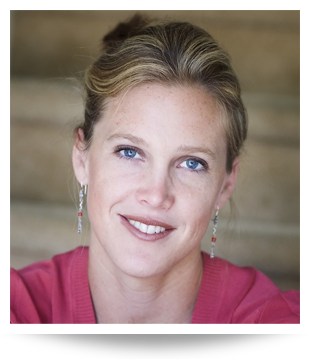 Jill is a former coaching director of FitLife.tv and a recent founder of In Heart Flow. LiveFitNow.tv has invited Jill to host this series of interviews on wholefood nutrition, prep meals and overcoming fitness obstacles. Joint promote the summit with 2 solo emails and 2 newsletters between 15th April – April 30th. Spaces for experts are limited! Please read the requirements above and respond at your earliest convenience if you’d like to become part of the Healthy Never Tasted Better Summit! It is my job to reach-out to other websites in similar markets in an effort to develop collaborative relationships. We would love the opportunity to guest post on your blog. If you are open to it, we would like to send you a very well written and edited article which you could post onto your website. We will never re-use or re-purpose this content. It will be 100% original and unique content produced exclusively for you and your website. We would include a link back to https://westsidetreatment.com/ within the article. I am Ian Schell, I have suffered depression and anxiety most of my adult life. On my 21st birthday in 2000, attempted to end my life, but fortunately, I messed that up. In 2014 I contemplated it once more. This time with a wife and kids, it wasn’t an option. I got good holistic help, new info and tools. Now, I am glad to say, happier and healthier than ever. I am now on a mission to share that holistic information, to help people improve the quality of their lives. To do that, I wrote my first book ‘DeFunkMe: The Basix’ which explores the six essentials to beat stress, depression and anxiety. I need to get this book into the hands of as many people as possible. It is not about the money or fame, just getting the info out. I need help to do this. I have a 55 strong launch team of friends and family, who have generously volunteered their time and efforts to help pump the launch on Amazon May 8. Through our efforts to date, we have 156 people signed up for the free promotional download on May 8&9. Come launch day, we will work together to hopefully get 1000 free downloads. I am searching for influencers who may be willing to help the cause, to get this info out, and lift people up. I realise you probably have these sorts of requests all the time, and I appreciate your time thus far! Unfortunately, I don’t have a lot to offer in return, other than some solid info for your audiences. Please let me know if you’d be willing to help in any way. If not that is ok too! For anyone who has ever suffered from depression or anxiety, has felt not worthy, then this film is for you. Depression is a problem, but how many people have actually had an insight into what it actually feels like? Mental health issues are still stigmatised and often ignored ,especially when it’s men who are suffering. ‘S.A.D.’ is an important film that aims to put the viewer directly in the shoes of someone struggling from depression and his downward spiral when help isn’t sought. Hi Therese, I came across your post searching for something. Searching for an answer I know I won’t find. No offense but the minute I pulled up your post, I could see the same look in your eyes, and the smile we all hide behind. Strangely it gave me a sense of trust, and so I decided to continue reading your post. I was even more comforted to find the quote by David Foster Wallace, a quote I must have a shared a thousand times with others; part as an indirect explanation of my own feelings and cry for help; part as comfort to the grieving, and part as way to enlighten the ignorant and judgemental. It’s amazing to see the time line difference of your post and all the papers, emails,and texts I’ve sent with pretty much similar details. Then, in the about section, it stated your spouse’s name, guess what the same. I chuckled. No coincidence (I pay attention to weird things ). Thanks for posting. I’ve pretty much come to the point where talking myself back to life, bargaining for life, is not working. I’ve reached out, which felt like a burden has been lifted to a point, but the pain….the pain, and noise is still standing strong. Please email me. Thanks. I don’t know that I expect anything should you respond, but it’s comforting to know you get it. Besides the David Foster Wallace quote, your post was the next best thing, to truly explain it all in few words. Especially the part about being envious of the dead. Thanks so much. I think we all know when our time is getting closer, to sneeze. Email if you get this please. Good work! Thanks. I’m reaching out on behalf of PatientsLikeMe, the world’s largest personalized health network, to explore a potential partnership. We’re fans of your work and would love to speak with you about opportunities to co-create content. Is there an email address I can use to send more details? My email address is fake because I don’t want my name on-line, but I wanted you to know that your article about going to the mall and taking your daughter to the mall has helped me. I cried as I read it, because I don’t know anyone else who suffers from that sort of problem and it was so comforting to know I’m not alone. I found the article because I was searching for information on sensitivity to noise. Noise sensitivity has had an extreme impact on both my personal and work life. I don’t think I realized how debilitating it has been until today, that’s part of the reason I cried. Snapping binders, loud talkers, pen clickers (people who absent mindedly click their pens), shrill laughter or giggling, background music or thumping bass in a car . . . noises such as these drive me nearly out of my mind. I have put up with it most of my life and have sought help in the past, but no one seems to understand. Thanks to you, I no longer feel so alone and will try again to find some help. Thank you so much for sharing your story. It was very brave and I am grateful to you. Many thanks to Therese for creating this wonderful platform. It is fascinating to see so many people talk about poor mental health and mental disability, and yet the root cause of the problem and alternative solution are unclear to most of us. Thanks to psychology for providing many insights into mental health issue. More to this point, for many decades, we have been told that our national progress and well-being can be measured in terms of GDP, per capita income and technology, which is, for the most part, true. The Western world or welfare societies ranks extremely high on these factors. It is fairly clear that in any given society at any point in time people with higher incomes would generally have a higher life satisfaction and better mental health than those with lower incomes. Just read your commentary on suicidal depression and can say you are right on. Most of my family suffers from depression and although I don’t know how many of them have been to the brink, I’ve been there twice. The suicides of Kate Spade and then Anthony Bourdain had a very profound effect on me, I had read this might be an issue for people but didn’t think it would be me. Eventually, I struggled back to my level of normal but it took a while so plan to visit a hypnotherapist to determine if this is a rollover from a past life or not. Have been on low-level meds for high blood pressure for the first time in my life and the first six months were dismal. Lately, I’ve read these freely prescribed meds are on the list of over 200 that are known to cause depression and possible suicide. In another 30 lbs perhaps I can leave those meds behind and not suffer side effects! Due to a personal awakening experience many years ago, I’ve spent considerable time studying reincarnation research by Ian Stevenson, Jim Tucker, Brian Weiss and Michael Newton to name a few. Sometimes our urge to go home to that happy place can also be overwhelming, there are no worries on the other side. At one point nothing else matters, those of us who have been here many times often find it simpler to move on and eventually decide on our new assignment or just wait a few hundred years. One source claims 2/3 of the world’s population now believe in reincarnation, one way or another. That is most likely due to having an experience that points to the existence of the process, amazing as it is. To maintain my own focus and forward movement it has been necessary to learn and rely on the basics of goal setting, meditation, positivity and raising my vibration. If we decide to bail on our earthly existence then that is a personal decision often regretted on the other side; there are usually answers and solutions for things we find unbearable. Patience is a learned and valuable asset, we do need to avoid being caught up in all the chaos of modern life. We make our own choices and have to live with them unless we change our mind in time. We can also place ourselves in dangerous situations knowing it might be a way out. I’ve heard if we decide to move on the Universe will find a way to grant that wish. One of my favorite mediums who ‘tells it like it is’ has an amazing online archive and regular blog posts. If you’ve not found her yet, Google Erin Pavlina ~ definitely eye-opening and very consoling as well. My fiance struggles with Generalized Anxiety Disorder, PTSD, and OCD. We have been together for almost eight years. His disorders are a result of emotional neglect, abuse and trauma during childhood as well as emotional abuse and trauma as an adult. Currently he is being held in jail on a crime he did not commit. Everyone is making it about his issues instead of what happened. His biological parents have stopped talking to me. They have made it clear that they do not want to continue to support him financially unless he makes a bunch of promises that he can’t guarantee he will be able to keep. They have also made it clear that they don’t want to spend more money if he cannot be “fixed”. The DA wants him to promise not to return to the county we live in as a condition of his release so he will be effectively homeless. I am trying to raise money to to pay for the treatment the DA wants, as well as relocation and continued treatment after he leaves residential. Please consider sharing my story and the link to my GoFundMe page. Thanks for what you are doing and thank you in advance for your time and consideration. God bless. I just came across your article “What Suicidal Depression Feels Like (The Sneeze)” while having one of my decades old moments. The sneeze is such an appropriate description of that “moment.” Thank you for putting it to paper so I may express it when I do not have the words to do so correctly for others to understand. I have always fought consciously falling for the last time knowing all the ramifications of what it would cause to myself and loved ones; what worried me the most was an unconscious, unplanned sneeze when I was unguarded. Now, at 65, my energy to fight this is fading. May not go that way, but living a life where I must shut down completely to live is the life of a zombie. My name is Raj Karki, I am from Nepal. I have suffered anxiety and depression throughout all my life. I have recently found out the things I have lost because of it. Now I want to pursue the field of Mental Health and Well Being academically, so that I can help others like me. So that, they don’t have to suffer like me. I want to be a researcher in Mental Health and Well Being. •	Ran for 550 days and recorded the ritual of each day for Running for Life Project. Experience of writing articles and blogging. Mam, if you know someone who can help me to pursue my future study in the field of Mental Health and Well Being. I would like to hear from you Mam. I just recently read your article on gluten sensitivity, anxiety and depression. I finally figure this out for myself about 10 months ago after 3 years of not feeling like myself and very up and down battles with anxiety and depression. I would wake up every night at 3am in a fight or flight mode and never get back to sleep. I lost a job because of it. Just this week I ate something I should have and I immediately tailspinned into a really bad mood, disconnected from my feelings I caused a major issue with my wife out of nowhere. The shame of causing that sent me into another tailspin. I spent my night thinking of writing my family suicide notes and driving off a bridge. It’s INSANE how much this effects my brain. Anyway, I was refreshed to hear your own testimony about the effects gluten had on you including death thoughts. My wife is a therapist but, she’s having a difficult time navigating the intense swings I get from gluten. Thanks for advocating!!! I am currently a senior at Riverdale High School and am in the process of gathering resources for my Senior Exhibition. Senior Exhibition is a project you do in your senior year in which you choose a highly controversial topic and go into depth about the topic in a presentation and research paper. It prepares us for college by improving our writing and public speaking skills. In addition to articles, texts and reference materials, I am also searching for an adult who is knowledgeable about my area of interest and would be willing to assist me as I seek to complete my project. To what extent are prescription-based treatment plans effective and sustainable in the treatment of depression, specifically for teenagers? I would appreciate any help you might be able to offer, whether that is working with you, or a referral to another possible contact, and look forward to hearing from you soon. I have copied my advisor at school, should you have any clarifying questions regarding the requirements, please do not hesitate to contact her. My name is Louis Le. I am a marketing specialist at The Migraine Stopper. I recently found you and your work through HealthCenter, and almost immediately, I have become your fan! Your works on depression are amazing and I wish I have found your website earlier, during the time I experience my very first depression. A quote on one of your article, “Life isn’t about waiting for the storm to pass, it’s about learning to dance in the rain”, I read this line with a sort of warm feeling running from my stomach through my back and up to my neck. Mainly because I felt so related. That was exactly what I did, I embrace it and over time, it just passes, bit by bit. Anyways, I wish I could tell you more about this, but I am contacting you with purpose, to spread the awareness on migraine and how bad it could actually affect people life. It’s not so hard to find research which indicates migraine can lead to stress, depression or even worse, suicide. I would love to contribute some articles to address this matter and I was hoping if you can have a look at some of those and maybe consider to put them on your website. I believe together we can contribute more to our community. All for a better life. Thank you for your time. Looking forward to hearing back from you.